The Oldest, Stoutest Form of Hoe. The eye hoe pattern dates back to ancient Rome and before. It is a common tool throughout Africa, Asia, Europe and both South and Central America. It was once common in North America but was largely supplanted by the lighter, smaller American pattern garden hoe. In Europe, eye hoes are available in dozens of patterns and sizes: square, rectangular, v-shaped, rounded, tapered, cupped and pierced. Here, in the USA, only the rectangular blades are generally available. 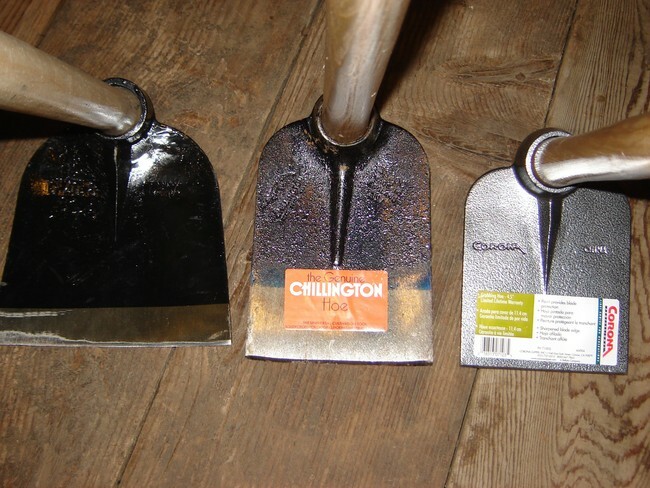 Our collection of eye hoes include a narrow (5 1/3"x6") floral hoe; a wider (6"x8") hoe and a large (7 3/4"x8") one. The handle length is 60 inches or 54 inches upon request. The handles, which are turned with straight sides, are easily shortened. However, they don't stretch. So, if you need a longer handle it's a custom turning, which can get pricey, or a trip to the woods to find an appropriate sapling. Eye hoes, a form of draw hoe, are used for scalping and scraping away or uprooting weeds, and for breaking and moving earth. The latter task is accomplished by swinging the tool downward to bury the blade in the earth. Then, lift the handle and pry loose a clod of dirt. Lift the handle in an arc, swinging and stopping suddenly, pitching the clod away. I have seen pictures of hordes of Chinese laborers excavating canals with only eye hoes. Note: These hoes are not made by Red Pig Garden Tools.